Dreaming of an escape to exotic locations? This Thai dish will give you an appetite for travel. Pork is an underrated meat but carries flavour well and is simple to prepare. Whether slow-cooked or quickly fried, it remains tender and succulent. 1. Combine the pork and the remaining ingredients – except the oil, coriander and lime – in a plastic press-seal bag and refrigerate overnight. 2. 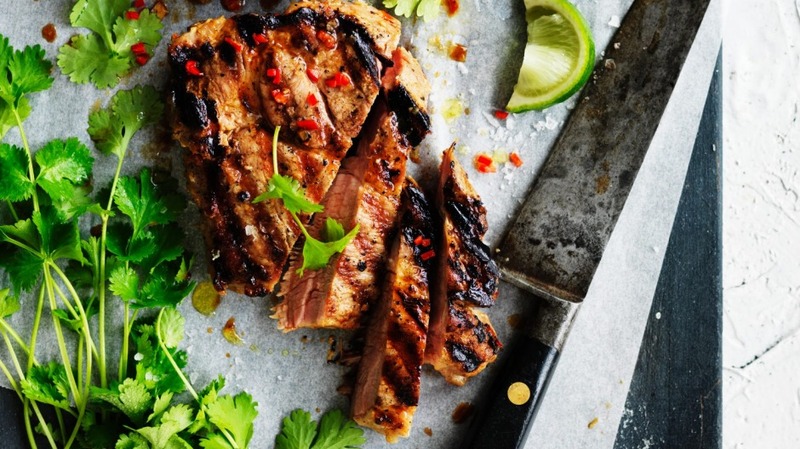 Grill the pork steaks on a barbecue or hot frying pan for about four minutes each side until cooked through. 3. Rest for a further three minutes and serve scattered with the coriander and lime wedges.